Whether it’s homemade chicken pot pie, a steak from Baker’s Cafe, or a frozen custard at Meyer’s Lake, the food of Stark County has made mouths water for generations. The region’s unique soil nurtured an early boom in agriculture, and growers like K.W. Zellers & Son Farms still find success today. Forgotten mom-and-pop grocery stores such as Flory’s and Lemmon’s served the needs of their neighborhoods, while long-gone restaurants like Mergus and Topp’s Chalet created delicious dishes and cherished memories. Other, like Bender’s Tavern and Taggart’s Ice Cream Parlor, serve the same legendary fare they have for decades. Families such as the Millers and Swaldos have created nationally recognized destinations out of small and simple starts. 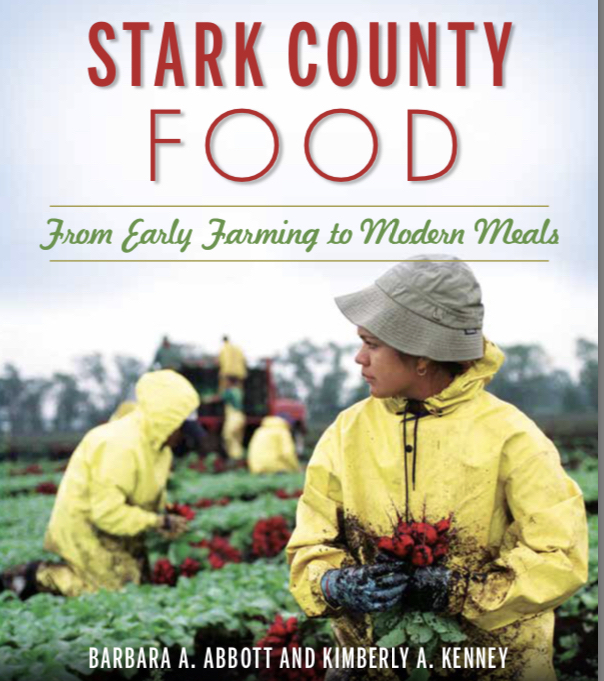 Abbott and Kenney trace Stark County’s food history from the earliest orchards and farms to today’s culinary scene. If you would like your copy inscribed, please send an email to Barb Abbott after you complete your transaction to request your specific inscription. If you would prefer to purchase the book in person, we can arrange that at the Canton Food Tours storefront, 555 Market Ave N in downtown Canton. In person sales are by appointment. Email barb@cantonfoodtours.com to schedule.